There are no guarantees for success when applying fungicides for control of root diseases. Since pathogens are hidden beneath the turf surface, and no fungicide will move down through the plant to the roots, we must rely on delivery of fungicide through the thatch and substrate to stop fungal growth. The delivery issues place a high priority on selecting the right product for the job. Published reports that document fungicide performance against root diseases are scarce. I searched a highly regarded archive of fungicide efficacy data (results?) and found hundreds of reports on dollar spot and brown patch control. However, there were only a dozen that addressed fungicide efficacy against summer patch (Figure 1), necrotic ring spot (Figure 2), and take all patch. A few reports were useful. Several of the others were embarrassingly void of any valuable information. There are reasons why such data are scarce. Root pathogens are not very cooperative in the lab. Acquiring pure cultures and raising inoculum is a challenge even for the most accomplished turf pathologists. Root pathogens grow slowly and often cannot compete with naturally occurring microbes when introduced into turf soils at experimental sites. These confounding factors contribute to messy data with unacceptable levels of variation in the field. Furthermore “natural infestations” are not uniformly or randomly distributed. Instead, root pathogens tend to be clustered in soils, and therefore lead to inconsistent results within replicates. Demonstrating “statistical significance” among treatments is often problematic. Despite the difficulties with root pathogens, we are still obliged to base our recommendations on valid information. In my lab, we try to understand how fungicides affect fungal growth. We raise fungal pathogens in pure culture, and then grow them on a sterile agar substrate amended with fungicide. Measuring colony growth on culture plates with different fungicide concentrations provides some sense of the innate potency of an active ingredient. These simple experiments pit fungicide vs. fungus—no agronomic issues—no environmental abnormalities—no nutritional stress. This is “mano a mano”. Although we are cautious about drawing field level conclusions from lab results, the lab experiments do provide us with some insight. Figure 3 illustrates how fungal growth is affected by different concentrations of fungicide representing four classes (benzimidazoles, dicarboximides, DMI and QoI). A dilutions series (0 ppm, 0.01 ppm, 0.1 ppm, 1.0 ppm, and 10 ppm) was prepared for each active ingredient. As a point of reference, a concentration of 1.0 fl oz per 1000 sq ft of Banner Maxx in a spray volume equivalent to 2 gallons per 1000 sq ft results in a tank mixture of about 600 ppm propiconazole. Pure cultures of the summer patch pathogen (Magnaporthe poae) (Figure 3 top) and the necrotic ring spot pathogen (Leptosphaeria korrae) (Figure 3 bottom) were plated out on the dilution series. The results are straightforward, and remarkably similar for the two (closely related) root pathogens. The DMI and QoI fungicides limited fungal growth at 0.1 ppm. Of the two root pathogens, the summer patch isolate (M. poae) seemed more sensitive. Results were consistent over many runs of the experiment. This information offers an objective basis for defining the activity of fungicides against root-infecting pathogens. The challenge going forward is to determine how to apply effective fungicides to realize the lab potential in the field. Figure 3. (top) Growth of the summer patch pathogen (Magnaporthe poae) (top) and the necrotic ring spot pathogen (Leptosphaeria korrae) (bottom) on culture plates amended with different concentrations of four fungicides. 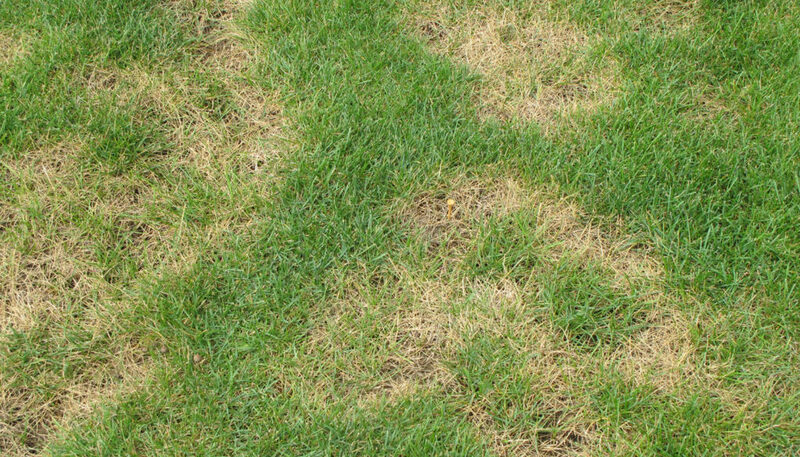 The bottom line– There is a lot of uncertainty about fungicides for controlling root diseases. Unfortunately, anecdotal evidence and hearsay often fill the void left by the absence of hard data. As we reflect on 2016 and look ahead to next year, I encourage turf managers to be resourceful in asking questions and learning as much as possible about the products they regularly apply for root disease control.